Kobe Bryant willed the Los Angeles Lakers to a crucial victory over the Clippers, who won style points with some flashy plays but couldn't overcome a well-rested Andrew Bynum. Bynum scored 36 points after missing a game with a sprained left ankle, Bryant added 31 and the Lakers won 113-108 on Wednesday night to widen their Pacific Division lead to 21/2 games over the second-place Clippers. The Lakers also snapped the Clippers' winning streak at six, the franchise's best in 20 years. 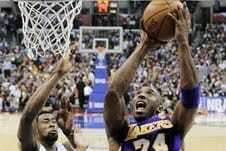 "Kobe didn't want to lose," Bynum said. "We are fighting for a playoff spot. They are one game behind us, so we had to get this win." By taking two out of three against their Staples Center co-tenants, the Lakers also earned the head-to-head tiebreaker in a game that could help decide the division winner and playoff seeding in the West. The division winner will likely earn the No. 3 seed behind Oklahoma City and San Antonio. "They're going to make spectacular plays, but we talked about playing poised and composed," Bryant said. "They have so many weapons. But it's not any different than some of the other top teams that we face in the league. The crowd obviously gave them a lot of energy and their bench gave them a lot of energy, but we maintained our composure and made big plays." Former Laker Caron Butler scored 28 points to lead six Clippers in double figures. Chris Paul added 22 points and 16 assists, Blake Griffin had 15 points and 14 rebounds, and DeAndre Jordan had 11 points and 13 rebounds for the West's fourth-place team, the designated home team in this matchup. "Ain't no moral victories around here," Paul said. "They won the game and that's that." Ramon Sessions added 16 points and eight assists for the Lakers, who won their fourth in a row. "We miscommunicated a lot of times, worried about Kobe a little too much and we were giving up layups to Sessions," Paul said. Bynum bounced back with an offensive performance that was one point off his season high after injuring his ankle Sunday and running afoul of the front office with some questionable on-court behavior. "It hurts a little bit, especially on spin moves," Bynum said. "I found more little things out there that hurt so I tried to stay away from them. As the game progresses, the pain subsides." With the Lakers clinging to a two-point lead, Bryant hit a jumper over Randy Foye to make it 110-106 with 24 seconds left. Paul missed a jumper and Griffin was called for a loose ball foul on Pau Gasol, who made one of two free throws with 18 seconds left. "Both teams really wanted it," former Clipper and current Laker Steve Blake said. "It was physical and both teams were changing their game plans on the fly and it was fun to be out there." Griffin's tip drew the Clippers within three, but Nick Young fouled Matt Barnes, who made both free throws. Paul's turnover and foul gave the Lakers the ball with 4 seconds to go, ending the Clippers' chances to win the season series for the first in 19 years. "Our defense wasn't as good as we'd like it to be and that was part of the problem," Paul said. "We sort of gave up everything. They had 63 in the first half. Kobe was shooting a lot early. He had it going and so did Bynum." The Clippers trailed by 11 to start the fourth and scored the first eight points to get to 92-89. Young had nine of their first 12 points. Eric Bledsoe hit a 3-pointer to get the Clippers to 98-96. The final 7 minutes were a four-point game. Paul's jumper tied it at 102 and the Clippers took their first lead, 104-103, since early in the game on Jordan's hook. Bryant scored over Butler and then Metta World Peace stole the ball from Paul. Bynum got fouled and made one of two free throws to put the Lakers back in front, 106-104. After consecutive turnovers by both teams, Sessions scored on a driving layup with 47 seconds left to keep the Lakers ahead by four. "We had a couple key turnovers and they made the bigger plays at the end of the game," said Paul, who had two of the Clippers' four turnovers in the final 2:45. "We got to learn how to win these games and close these out. It was a good learning process for us because this is how the playoffs are." The Lakers led 73-61 early in the third quarter. The Clippers rallied on a 12-5 run that cut their deficit to five points. Griffin soared to dunk one-handed over Gasol, who argued that Griffin had fouled him with the monster move that sent Gasol staggering toward the floor. But Griffin drew the foul and missed the free throw. "I really didn't see the ball when it went in. I was on my (rear)," Gasol said. "It happened too quick. I don't have a great desire to watch it (again)." Griffin hoped it would give the Clippers some much-needed momentum. "It was exciting," Paul said, "but at the end of the day we lost. Who cares?" Jordan dunked to reinvigorate the crowd and Butler scored the final five points in the spurt. But the Lakers answered with a 14-8 run to end the third up 92-78. Bynum had seven points and Bryant six. "It looked like his ankle wasn't giving him any problems," Griffin said. Jordan made a great play after trying to save the ball from going out of bounds with a leap over the courtside seats. His save got intercepted by the Lakers, but he climbed back over the seats and took off running. He dashed up behind Sessions and poked the ball away, leading to a 3-pointer by Butler to end the third.